Designation: Radiotherapy Department-Oncology Hospital, University hospital center Mohamed VI. List of Author(s): Hanine N, Bouahafa T, Sbai A, Mezouar L, Hassouni K.
Citation: Hanine N, Bouahafa T, Sbai A, Mezouar L, Hassouni K (2018) The Naso-Sinusian Chondrosarcoma: Case Report and Review of Literature. Int J Cancer Tremnt. Vol: 1, Issu: 1 (40-42). Copyright: © 2018 Hanine N. This is an open-access article distributed under the terms of the Creative Commons Attribution License, which permits unrestricted use, distribution, and reproduction in any medium, provided the original author and source are credited. Introduction: Chondrosarcoma is a highly destructive malignant tumor of cartilage, bone and mesenchymal origin. Localization around the head and neck is rare and the naso-sinus seat is even rarer. Observation: We report an observation of a 54-year-old woman who had been consulting for nasal obstruction for one year without epistaxis. Nasal endoscopy revealed a polypoid mass, budding, pediculated, in the left nasal fossa. Imaging confirmed the presence of a relatively homogenous cystic hypodense lesion 5/3 cm from the left nasal fossa, extending to the jugular wall through maxillary osteolysis extending into the left maxillary sinus at the fluid straits in the last and pushing the nasal septum to the right. Discussion: Chondrosarcoma represents 10 to 15 % of malignant bone tumors. There are two types of chondrosarcoma: those that originate from normal cartilage tissue, and those that have ossified from cartilage. MRI is the key exam. The lobulated character and the presence of calcifications with peripheral enhancement are arguments in favor of the diagnosis of chondrosarcoma. The treatment is surgical. Conclusion: The prognosis of these tumors remains reserved. It depends on the histological grade, the tumor extension, and the quality of the excision. Chondrosarcoma is a primary malignant tumor of the bone producing tumor cartilage without ever developing tumorous bone tissue . It accounts for 10 to 20% of bone malignancies  and only 7% of chondrosarcomas affect the head and neck region . The naso-sinus localization is rare: only about twenty cases have been reported in the literature . This is a patient aged 53, asthmatic under treatment, her history of disease back to 4 years by the appearance of a lesion at the left nostril, gradually increasing in volume, the symptomatology was aggravated by the appearance of a nasal obstruction which motivated the patient to consult at an ENT, where she benefited from a biopsy of the lesion including histopathological examination in favor of a well-differentiated chondrosarcoma of low grade (grade 1 according to Ackerman’s classification) (Figure 1). Histological appearance of well-differentiated low-grade chondrosarcoma (grade 1 according to Ackerman's classification). 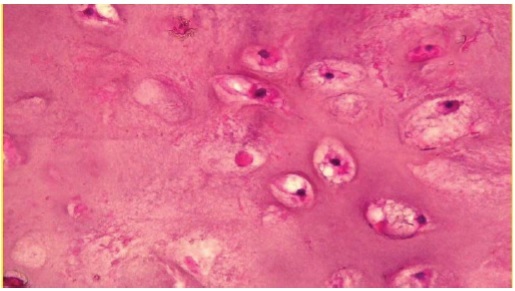 Figure 1: Histological appearance of well-differentiated low-grade chondrosarcoma (grade 1 according to Ackerman's classification). Head and neck CT were in favor of a relatively homogeneous cystic hypodense lesion 5/3 cm from the left nasal fossa, extending to the juxtal wall through maxillary osteolysis extending into the left maxillary sinus and pushing back the septum nasal to the right (Figure 2). A thoraco-abdominopelvic CT scan was normal. The patient was operated in January 2011. 3 years later, the patient developed a locoregional recurrence of the disease, for which it was operated the month 07 in 2014, the surgical procedure was not only to remove the tumor lesion but also the anterior wall of the left maxillary sinus quasi -otality of the ipsilateral bone hemophilia and the outer wall of the left nasal fossa. The bone infiltration of the palate was obvious, and despite the bone exeresis, a doubt persists for the anterior dental arch and the medial part of the bony palate (Figure 3). Axial section of a cervico-facial CT showing the tumor process. Figure 2: Axial section of a cervico-facial CT showing the tumor process. Head section of a cervico-facial CT showing the extension of the tumor. Figure 3: Head section of a cervico-facial CT showing the extension of the tumor. The patient subsequently received adjuvant modulating radiation therapy (IMRT) at a total dose of 50Gy, based on a conventional 2 Gy/fr fractionation in 25 sessions. The patient had acute adverse effects to radiotherapy: a mucositis grade 2 for which she received symptomatic treatment with an improvement in consultation controla. 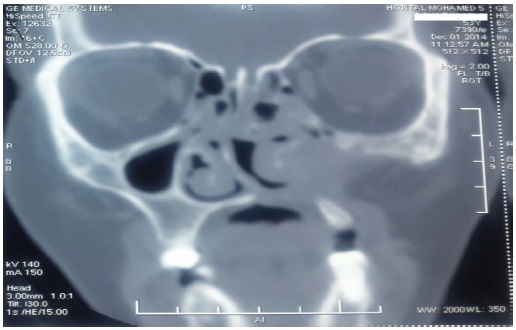 The patient is still in good locoregional control in the quarterly clinical controls, and a control MRI done one year after the external radiotherapy was in favor of a nodular thickening of the nasal septum with right lateral deviation, without tumor recurrence. visible, with 2 years and 2 months of decline. Chondrosarcoma is a heterogeneous group of malignant tumors of cartilage origin but also bone and mesenchymal . 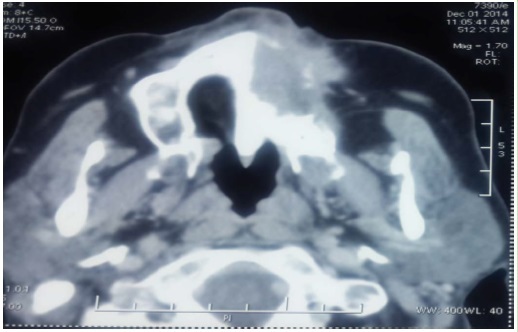 The localization at the level of the head and neck is rare, it represents 0.1% of the carcinomas of this region , the chondrosarcoma of the sinuses of the face is still very rare. The usual chondrosarcoma sites at the maxillofacial level are nasal cavities, paranasal sinuses and the mandible. The male predominance  is noted by several authors, often between the fourth is the seventh decade , our two patients fall into this age range. Chondrosarcomas originating in cartilaginous tissue and soft tissues are common in men after age 50 and bone chondrosarcomas are common in women and patients under 50 . Lymph node and distant metastases are rare and account for 5.6% and 6.7% respectively . Clinical imaging is based primarily on CT and MRI. The CT scan shows a lobulated tumor with irregular contours, destructive and of lower density than the bone, sometimes with calcifications. CT provides details on bone destruction, including the ethmoid-riddled lamina, the orbital walls, the bony palate, and the infra-temporal fossa. MRI specifies extension to essentially sensory and vital soft tissues and differentiates between granulomatous tissues and recurrences when monitoring operated chondrosarcomas . MRI is not done in our patient. The biopsy is made easy thanks to endonasal endoscopy. The diagnosis of certainty is histological and immunohistochemical, the difference between chondroma and chondrosarcoma is difficult for anatomopathologists . Chondrosarcomas are classified into three grades based on tissue density, nuclear differentiation, and nucleus size . The histological types are the myxoid variant is more soft tissue than bone, the mesenchymal variant is the most aggressive and occurs in two thirds of cases before age 30 and advanced grade . The treatment is mainly surgical combined with radiotherapy despite the difference of opinion on the radiosensitivity of chondrosarcomas. Chemotherapy has a limited role in this treatment, indicated in cases of highgrade malignancy, mesenchymal chondrosarcoma and in recurrences or metastases . The 5-year survival is 44 to 87% [4,10], the prognostic factors are, the age, the grade, the primary site of the tumor and the myxoid or mesenchymal variant. Patients treated with surgery alone or with radiotherapy have a better prognosis than those treated with chemotherapy alone [11,12]. The chondrosarcoma of the sinuses of the face is a rare and aggressive tumor, its evolution is slow. Clinical imaging is very important in all diagnostic, therapeutic and surveillance stages. Surgical excision is a very important factor in the success of treatment and the decrease in the frequency of recurrences.